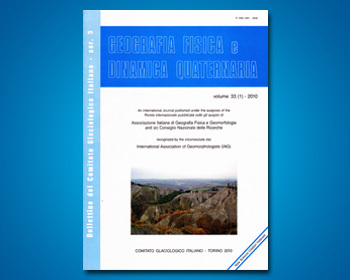 PALMENTOLA G. & ACQUAFREDDA P.
With the aid of bibliographic news, dealing with the glacial Quaternary traces on the Matese Mountain (COLAMONICO, 1930; SUTER, 1932-1934; CASTALDO, 1965) a sequence of studies has been carried out. During it the already known glacial forms have been re-examined; some new ones have been discovered, making it possible to evaluate more accurately the extent of the glacialisation on the massif. Here the highest points (from NW to SE: Colle Tamburo, 1 982 m; Monte Miletto, 2 050 m; La Gallinola, 1 923 m) reveal they were once covered with large glacial masses which have shaped wide areas and have deposited large morainic sediments, now broken up in several slabs by the postglacial erosion. An accurate study of the shapes and of the location of morainic deposits have made it possible to estimate that the maximum height of the snow-line, first corresponded to a level of the present height of 1550 m about (maximum glacial expansion). It rose then in three stages to about 1 700, 1 750, 1 870 m respectively (stadial phases); afterwards a further raising would bring the snow-line near or even over the tops preventing in this way the continuation of the glacial activity. During the phase of maximum expansion on the massif there were at least four glacial tongues pushing downwards till 1 100 m about of altitude; two of them stretched down into the valleys of Folubrico and Fondacone (on the western side of Colle Tamburo), a third one descended from the cirque of Mt. Miletto towards the Campitello plain, flowing into the much larger glacial mass coming from SE, from the Gallinola area. Later on, a climate mitigation led to partial withdrawal of the glacial tongues that allowed the formation of discontinuous layers of crioclastic breccia covering the most recent morainic deposits: The first stadial phase brought the glacial fronts back to a position close to those of maximum expansion, so much that in many places its new morains were deposited over the previous ones. In the second stadial phase the glaciers of the Folubrico and Fondacone survived only within their own cirques for the contributions of the overlying surfaces of Colle Tamburo; the glacial tongue of Mt. Miletto stopped near the present height of 1500 m (without ever reaching the. Campitello plain), while the Gallinola’s didn’t overcome the limits of Campo Puzzo. In the third and last stadial phase, only Mt. Miletto had surfaces and shapes above the snow-line, permitting the survival of a small glacier of Pirenaic type. It shaped the little morainic bank at the border of the homonymous cirque. The deposits accumulated during the glacial activity, alike in grain-size and completely incemented, can be referred to the Würm period, for their newness, and mainly for their clear facies similarity to morainic deposits of the Apenninic chain, which are referred by many Authors to the same age. This dating wouldn’t appear to be applicable to every glacial cirques shaped on the massif: one in particular, the S. Nicola’s scarp that lacks higher tributary surfaces, and is located above the lowest snow-line, has remained virtually unaffected by postglacial erosions: it opens up to a typically fluvial valley, where there are no morainic deposits. The Folubrico and Fondacone cirques show, on the whole, similar features but, although they have been already reached by the going-up erosion, they still keep both internally and in the valleys they join into, significant and relatively abundant morainic deposits. All these examined data take us to think that the S. Nicola cirque has been shaped by a pre-Würmian glaciation, and it was not affected subsequently by significant glacialisation. The Folubrico and Fondacone cirques, on the contrary, essentially for the presence of wide snowcovereed surfaces overlying them, were also interested by würmian ices.